(Release Date: November 18, 2014)  "Ragnarok" plays like Norway's answer to "Jurassic Park." If the film, directed by Mikkel Brænne Sandemose, is derivative of Steven Spielberg's 1993 blockbuster, the skillfulness with which the similarities are deposited is also what makes it memorable. When widowed archaeologist Sigurd Svendsen (Pål Sverre Hagen) finds an ancient rune with a purported map pointing to an Oseberg gravesite that may hold the key to the Ragnarok myth, he is disappointed when the museum he works for denies his request for funding. Taking matters into his own hands, Sigurd hires colleague/assistant Allan (Nicolai Cleve Broch) and archaeologist Elisabeth (Sofia Helin) to accompany him and his kids, Ragnhild (Maria Annette Tanderød Berglyd) and Brage (Julian Rasmussen Podolski), on an expedition to the desolate location in Finnmark. Lurking among the caves and waterways is something far more dangerous than what they bargained for. Magnolia Pictures' 1080p transfer of "Ragnarok" is satisfyingly accurate to source with just a few intermittent signs of banding rearing their head. Otherwise, colors are earthy and vibrant, blacks are deep and enveloping, and clarity is exceptional with just a couple CG effects shots appearing softer than everything that surrounds them. Sound-wise, the Norwegian 5.1 DTS-HD Master Audio (with accompanying English subtitles, if needed) is the way to go. This is a seat-rattlingly active lossless track that gave me goosebumps on multiple occasions. The monstrous roars on the soundtrack might as well have been happening directly in my home theater rather than from the back speakers. Do you love "Jurassic Park" and "Raiders of the Lost Ark" and long for a movie that is reminiscent of those? Look no further than "Ragnarok," but do temper expectations just a tad. This is not as good as those Spielberg mainstays, likely due to budgetary restraints, but once serious threats emerge, the creature is revealed, and the action gets cooking, there are family-friendly (albeit PG-13-level) thrills and chills to be had. 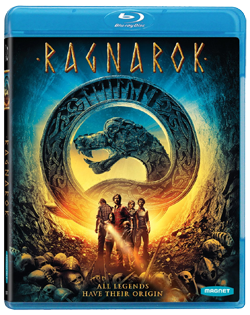 Magnolia's Blu-ray of "Ragnarok" is worth checking out.